Does it make you feel uneasy if someone you are talking to avoids looking at you, direct eye to eye contact? Is that learned behaviour on your part, or instinctive? Most psychologists would say it was learned, that you had experienced it before and been puzzled and made some assumptions – they are uncomfortable with you, they are guilty of something and they don’t want to look at you for instance. But what of the person who is avoiding the eye contact? Do they have something to hide, or are they simply not wanting to make any kind of contact with you? Are they painfully shy? 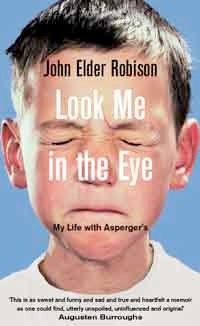 John Elder Robison has written an account of his life from when he realised he was different from other people. Unable to make eye contact or connect with other children and by the time he was a teenager his odd habits – an inclination to blurt out non sequiturs, behave obsessively – and earned the label social deviant. I found this book hard to put down and spent most of a day and evening reading it cover to cover. I have come across people who displayed some of the behaviours described by Robison, who was eventually identified as having Asperger’s syndrome at the age of 40 and who eventually was able to work hard to communicate and be able to socialise with greater ease. This fascinating book, a New York Times bestseller, mixes ascerbic wit with painful honesty, wry humour and clarity. It should help to break down some barriers to understanding the behaviour of anyone within the autistic spectrum. More importantly I think it should help anyone with Asperger’s syndrome to manage their interactions with their peers and society in general better and be more able to successfully survive the slings and arrows that life throws at us all.